New York, N.Y. Habitat for Humanity International was very important to my father. He had been a college professor and loved to build houses during the summer as his hobby. Eventually he volunteered with Habitat for Humanity, becoming our hometown’s construction supervisor. At his funeral in 2007, a professional looking woman approached me saying, “I believe you have no idea who I am, correct?” I confirmed that, unfortunately, I did not. “I was living with my daughter in a car when your father and Habitat built us a home. I used that home as a base to finish my education, get a job, and put my child through college. Your father and Habitat changed our lives,” she continued. Five months after the 2006 Jimmy Carter Work Project (JCWP), 100 homeowner families settled into their new homes to begin a new phase of their lives in Lonavala, India. 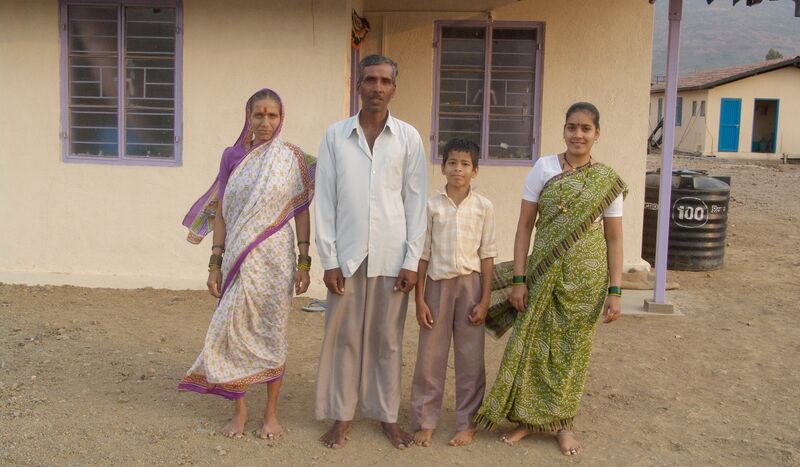 Habitat home partner Manda Gyaneshwar (left) with her husband Jadhav, grandson and daughter outside of their home (2007). Credit: Ryan Netto/ Habitat for Humanity International. Active in India for several decades at a sustainable level, Habitat has decided to ramp it up there. 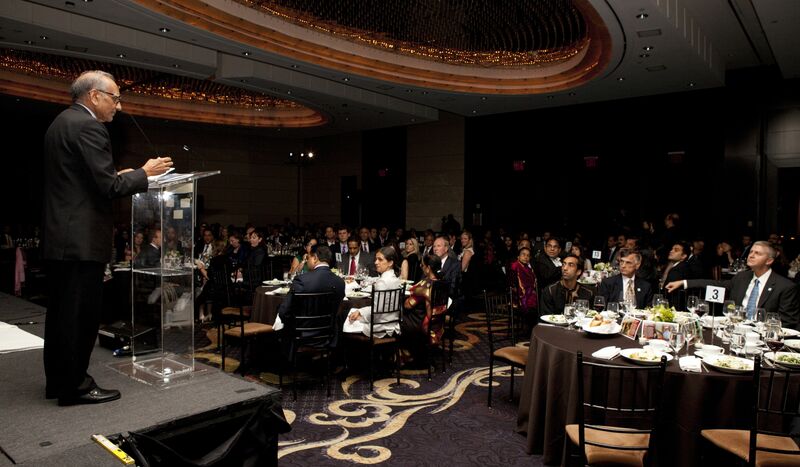 The multi-national organization has launched a campaign here in New York to fund home improvements for an astonishing 15,000 families per year in India – and to help at least 100,000 additional families per year in India improve their shelter conditions. Remarkable. I relayed this story to another woman I met last spring at the Mandarin Oriental overlooking Columbus Circle and Central Park, where Habitat launched its IndiaBUILDS North America initiative to raise $20 million from North America partners over the next five years to accelerate housing construction and access to clean water and proper sanitation in India. This woman asked me what brought me to the event. When I finished telling her about my dad, she looked stunned and asked, “Are you from Oxford, Ohio?” Surprised, I admitted I was. She told me she knew the story – that many in Habitat did. It was my turn to be stunned. It hit me: Habitat for Humanity transforms lives from Ohio to India. That is why the J. Luce Foundation and I support their work so strongly. Habitat for Humanity International IndiaBUILDS Gala 2013. Credit: Ezra Millstein/ Habitat for Humanity International. Habitat for Humanity began working in India in 1983 in Khammam, Andhra Pradesh. Habitat for Humanity India is now among the organization’s largest programs in the Asia-Pacific region, having served more than 45,000 families across 17 states. Nearly 225,000 people — almost a quarter of a million Indians — live in homes built or improved in partnership with Habitat for Humanity. 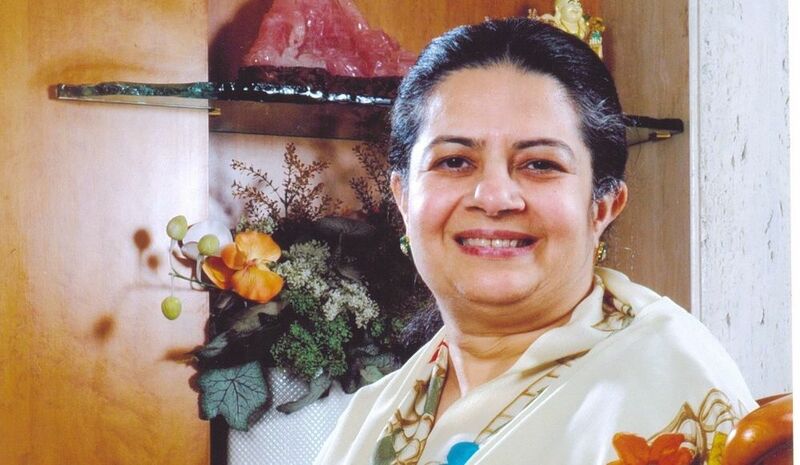 Rajashree Birla, co-chair of IndiaBUILDS (pictured). Credit: Habitat for Humanity International. Mrs. Rajashree Birla, director of Aditya Birla Group of companies and chair of Habitat for Humanity IndiaBUILDS, and Ron Terwilliger, chair, Global Development Council for Habitat for Humanity International, hosted the launch with the Mandarin Oriental cocktail reception and dinner. I met Ron, and we immediately discovered we had much in common, but sadly, Mrs. Rajashree Birla was not able to make it. We watched an incredibly gracious video from her in India welcoming us. Ron is a major homebuilder and developer based in Atlanta; I was surprised to learn he attended Harvard and the Naval War Academy, both co-founded by my forebears. We had much to chat about. Balgude working together on their future house in Maharashtra. Credit: Gregg Pachkowski/Habitat for Humanity International. I caught up with Mrs. Birla by phone after the event to find out more about her work. She is from one of India’s most prominent families and is a custodian of the Mahatma Gandhi legacy, supporting the university that carries his important name. I have been to India several times but not yet had the chance to meet with her. I have seen the remarkable change in people’s lives after they move into their Habitat home and can call it their home – the sheer sense of security, the interest in educating their children, and their general sense of well-being is absolutely amazing and touching. A home of their own will transform the future of their children and their aspirations. Ron Terwilliger at the IndiaBUILDS launch. Credit: Ezra Millstein/Habitat for Humanity International. Ron is also completely sold on this idea. 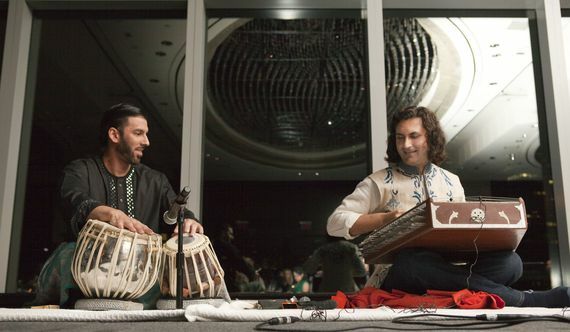 He said during the event, “I believe very deeply in building a life of success and significance. Through a 40-year career, I had much success building apartments here in the U.S. Now I am thrilled to help build significance. 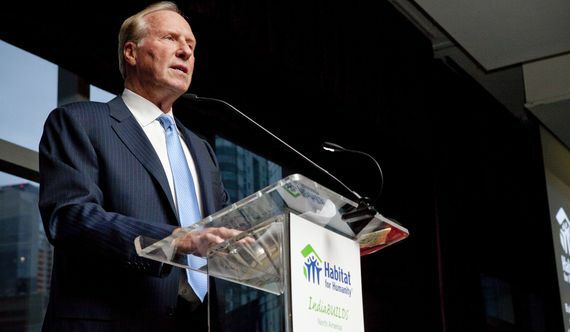 My legacy — besides caring for my family — will be marked by several housing charities that I support – both now and beyond my lifetime.” That’s a legacy that will change the future of generations to come. wife Vivitha and five children. Tamil Nadu, India. Credit: Kim MacDonald/Habitat for Humanity International. Housing Solutions Fund. Construction and repair of 5,500 homes. Water and Sanitation Fund. Supports construction of 2,500 water and sanitation facilities, and provides educational programs on hygiene and sanitation practices. MicroBuild Fund. Enables microfinance institutions offer small, affordable home improvement loans to 4,500 poor families. 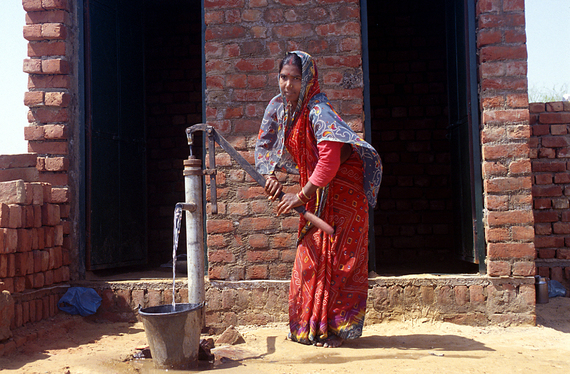 A woman draws water from a well in Rewari, India (2000). Credit: Alicia Wagner/Habitat for Humanity International. Disaster Response and Risk Reduction Fund. Enhances disaster response, preparedness and mitigation. Secures 4,000 emergency shelter kits for distribution. Capacity Building Fund. Expands Habitat’s work by investing in operating requirements to reach the scale of service to help even more Indian families in need of improved shelter. Around 1987 I was invited by Millard Fuller to Americus, Georgia to discuss ways in which I could help Habitat. I never made it and have regretted it ever since, but I did save the letter. Rahul Sharma and Salar Nader played for a most appreciative gala audience. Credit: Ezra Millstein/ Habitat for Humanity International. Many people have no idea that Habitat for Humanity International grew from Christian roots in 1976, building homes by hands, such as those of Jimmy Carter. I had been in the East Village, in an apartment built by President Carter and a team of volunteers – solid work stemming from their own faith, putting God’s love into action by bringing people together to build homes, communities, and hope. Today, Habitat is a global housing organization that has helped more than three million people construct, rehabilitate or preserve homes. Habitat works in more than seventy countries and welcomes people of all races, religions and nationalities to partner in its mission. Published originally in The Huffington Post, October 30, 2013.